Drawn into an unprecedented raid on the British Columbia legislature, impulsive RCMP Corporal Tim Murphy uncovers interconnected criminal activities pointing him to a startling secret with major implications for the entire country. Startling evidence is unconvered indicating that a major federal political party in British Columbia may have used the proceeds from drug sales to pay the membership fees for thousands of new party recruits. Over time other criminal activities are unearthed, including money laundering, influence-peddling, election rigging and finally, murder. Overcoming numerous challenges RCMP Corporal Tim Murphy moves ever closer to identifying the mastermind behind this complex sequence of organized unlawful activities. What he discovers could have significant and tragic ramifications for the province and perhaps the whole country. Merkley's story starts at the same point as the news stories did ... [the raid of the BC Legislature]... but gets way more interesting. Novelists get to write the story reporters dream of. Ken has perhaps created a new genre in literature, a sort of fictional/non fiction. This provides the author with an opportunity to discuss and speculate on evolving real life dramas. It [The Raid] has all the juicy ingredients essential to a good novel. 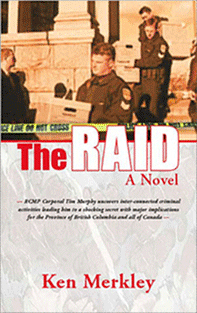 The Raid, an adventurous web of intrigue, passion, greed, power, tenderness and humour, peopled with colourful characters. He's received overwhelmingly positive feedback from readers. to the bottom of what was going that dya, The Raid is the next-best thing. I spent the day reading your book. It's a great read. I thoroughly enjoyed it!